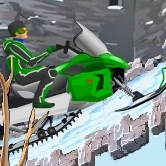 Gear up and hop on a Snow Mobile death machine to race in wild areas while performing extreme stunts! Use the arrow keys to drive, number keys for stunts, and dont forget to press the space bar to jump off ramps to gain massive air as well as to active adrenaline mode! Enjoy 9 Levels, 7 tricks, and 3 Snow mobiles.